The following is a list of mobile telecommunications networks using third-generation Universal Mobile Telecommunications System (UMTS) technology. This list does not aim to cover all networks, but instead focuses on networks deployed on frequencies other than 2100 MHz which is commonly deployed around the globe and on Multiband deployments. For technical details on UMTS and a list of its designated operating frequencies, bands, and their common names, see UMTS frequency bands. Networks on the global UMTS-bands 1 and 8 are suitable for global roaming in ITU Regions 1, 2 (some countries) and 3. Networks on UMTS-bands 2 and 4 allow roaming in ITU Region 2 (Americas) only. First commercial UMTS network to be deployed. POST Luxembourg 2100 1 June 2003  Provider formerly named LuxGSM. KPN Netherlands 900 / 2100 8 / 1 Q3 2013 / October 2004  Network to be shut down in 2022. Vodafone Netherlands 2100 1 June 2004  Network to be shut down in 2020. T-Mobile Poland 900 / 2100 8 / 1 April 2005  Provider formerly named Era. Meo Portugal 2100 1 April 2004  Provider formerly named TMN. NOS Portugal 2100 1 June 2004  Provider formerly named Optimus. Telekom Romania 900 / 2100 8 / 1 June 2008  Provider formerly named Cosmote. Telekom Slovenije Slovenia 2100 1 December 2003  Provider formerly named Mobitel. ^ "Djezzy signs up 60,000 3G subscribers in two weeks". TeleGeography. 2014-07-22. Retrieved 2014-08-13. ^ "Djezzy GSM to launch 3G during Ramadan". TeleGeography. 2014-06-25. Retrieved 2014-08-13. ^ "Nedjma confirms 3G launch, unveils pricing". Telecompaper. 2013-12-23. Retrieved 2014-05-05. ^ "Nedjma becomes Ooredoo Algeria". Telecompaper. 2013-11-07. Retrieved 2014-05-05. ^ "Batelco to launch 3G on 16 December". TeleGeography. 2007-12-13. Retrieved 2014-08-24. ^ "Batelco to expand HSPA+ network capabilities". TeleGeography. 2011-05-06. Retrieved 2014-08-13. ^ "Batelco unveils unlimited mobile broadband packages". Telecompaper. 2010-05-06. Retrieved 2014-08-13. ^ "Batelco launching 21Mbps HSPA+". TeleGeography. 2010-03-04. Retrieved 2014-08-24. ^ "Viva Upgrades Bahrain Network to 42Mbps Download Speeds". cellular-news. 2011-05-25. Retrieved 2014-08-13. ^ "MTC-Vodafone set for 3G launch". TeleGeography. 2004-12-13. Retrieved 2014-08-24. ^ "Moov Benin launches 3G for smartphone, tablet, modem users". TeleGeography. 2014-02-21. Retrieved 2014-11-27. ^ "Airtel launches 3G in Burkina Faso". TeleGeography. 2013-05-24. Retrieved 2016-12-24. ^ "Smart Telecom Burundi launches SMART 3G network". TeleGeography. 2014-09-22. Retrieved 2014-11-27. ^ "Viettel Cameroon starts selling SIM cards ahead of this month's official launch". TeleGeography. 2014-09-16. Retrieved 2014-11-27. ^ "Orange draws first blood with 3G launch in Bangui". TeleGeography. 2013-03-13. Retrieved 2014-08-13. ^ "Airtel launches 3G in Chad". TeleGeography. 2014-09-15. Retrieved 2016-12-24. ^ "Tigo launches HSPA+ technology under the '4H+' banner". TeleGeography. 2013-05-23. Retrieved 2014-08-13. ^ "Orange sets up in Democratic Republic of Congo". Telecoms.com. 2012-12-06. Retrieved 2014-08-13. ^ "Huawei completes second phase of HSPA+ deployment for Etisalat Misr". TeleGeography. 2010-05-06. Retrieved 2014-08-13. ^ "Mobinil launches 3G service". TeleGeography. 2008-09-03. Retrieved 2014-08-17. ^ "Airtel Gabon offers commercial HSPA+ services". TeleGeography. 2014-03-14. Retrieved 2014-08-13. ^ "Airtel Ghana launches HSPA+ service". TeleGeography. 2012-01-19. Retrieved 2014-08-13. ^ "Tigo Ghana upgrades to 3.5G". Telecompaper. 2011-07-11. Retrieved 2014-08-17. ^ "Tigo Ghana deploys DC-HSPA+ solution, report says". TeleGeography. 2017-02-07. Retrieved 2017-02-07. ^ "Airtel, Tigo merge in Ghana to form AirtelTigo". TeleGeography. 2017-11-15. Retrieved 2017-11-26. ^ "Zain launches 3.5G network in Ghana". TeleGeography. 2008-12-16. Retrieved 2014-08-17. ^ "HOT, Golan launch 3G networks". TeleGeography. 2012-05-15. Retrieved 2014-08-24. ^ "Pelephone launches HSPA network". TeleGeography. 2009-02-03. Retrieved 2014-08-24. ^ "Partner joins rivals in 3G market". TeleGeography. 2004-12-01. Retrieved 2014-08-24. ^ "Moov extends HSPA+ network to four new locations". TeleGeography. 2013-12-16. Retrieved 2014-08-13. ^ "Orange launches Kingdom's first 3G network". TeleGeography. 2010-03-04. Retrieved 2014-08-24. ^ "Orange Jordan launches 3G+ network". TeleGeography. 2010-03-30. Retrieved 2014-08-13. ^ "Umniah steals a march on rivals with '3.75G' launch". TeleGeography. 2012-06-18. Retrieved 2014-08-24. ^ "Zain Jordan launches HSPA+". Telecompaper. 2011-03-07. Retrieved 2014-08-24. ^ "Airtel launches long-delayed 3G network". TeleGeography. 2012-02-27. Retrieved 2014-08-17. ^ "Telkom Kenya launches 3G in Nairobi, Mombasa, Kisumu". TeleGeography. 2011-08-26. Retrieved 2014-08-17. ^ "Oranges Launches HSPA+ Upgrade in Kenyan Capital City". cellular-news. 2012-08-01. Retrieved 2014-08-13. ^ "Safaricom launches 3G". TeleGeography. 2008-05-27. Retrieved 2014-08-17. ^ "Safaricom increases data speeds for Nairobi customers". Telecompaper. 2011-08-23. Retrieved 2014-08-17. ^ "Safaricom poised to unveil 42Mbps download speeds". TeleGeography. 2012-04-04. Retrieved 2014-08-17. ^ "Viva launches mobile broadband". TeleGeography. 2009-01-15. Retrieved 2014-08-24. ^ "Viva Kuwait raises broadband speed to 21.6Mbps". Telecompaper. 2010-12-28. ^ "Viva Kuwait upgrades to 42.2Mbps". Telecompaper. 2011-07-04. Retrieved 2014-08-13. ^ "HSDPA comes to Kuwait". TeleGeography. 2006-02-09. Retrieved 2014-08-24. ^ "Alfa launches 3G+ service in Lebanon". Telecompaper. 2011-10-25. Retrieved 2014-08-24. ^ "MTC Touch launches HSPA+ services in Lebanon". Telecompaper. 2011-11-03. Retrieved 2014-08-24. ^ "Cellcom Launches HSPA+ Services in Liberia". cellular-news. 2012-07-12. Retrieved 2014-08-13. ^ "Novafone announces full relaunch; unveils 42Mbps DC-HSDPA connectivity". TeleGeography. 2013-09-16. Retrieved 2014-08-13. ^ a b "Airtel launches HSPA+ in Malawi, Madagascar". TeleGeography. 2012-07-23. Retrieved 2014-08-13. ^ "Telma launches commercial 3G services". TeleGeography. 2009-11-17. Retrieved 2014-08-17. ^ "Emtel wins 3G race". TeleGeography. 2004-12-01. Retrieved 2014-08-17. ^ "Emtel launches home/office internet over 3G/HSPA+". TeleGeography. 2013-01-02. Retrieved 2014-08-13. ^ "Inwi migrates to HSPA+". TeleGeography. 2014-03-24. Retrieved 2014-08-13. ^ "Maroc Telecom launches 3G, 3.5G services". TeleGeography. 2008-01-17. Retrieved 2014-08-17. ^ "Meditel launches HSDPA". TeleGeography. 2007-04-19. Retrieved 2014-08-17. ^ "MTC Namibia launches USD5.8 million 3.5G network". TeleGeography. 2006-12-18. Retrieved 2014-08-17. ^ "MTC expands LTE to pre-paid, upgrades 3G to fend off TN Mobile competition". TeleGeography. 2013-12-16. Retrieved 2014-08-13. ^ "Zain launches 3G services in Nigeria". Telecompaper. 2009-02-03. Retrieved 2014-08-17. ^ "Airtel Nigeria unveils DC-HSDPA network". TeleGeography. 2012-03-01. Retrieved 2014-08-13. ^ "Etisalat introduces HSPA+ services". TeleGeography. 2011-10-12. Retrieved 2014-08-17. ^ "Globacom and MTN unveil 3G". TeleGeography. 2007-12-12. Retrieved 2014-08-17. ^ "Oman Mobile launches 3.5G network". TeleGeography. 2009-01-21. Retrieved 2014-08-24. ^ "Qatar Telecom launches 3G video calls". Telecompaper. 2006-07-20. Retrieved 2014-08-24. ^ "Qtel upgrades mobile network to 21Mbps". Telecompaper. 2010-08-09. Retrieved 2014-08-13. ^ "Qatar Coverage and Network Information - Vodafone Qatar Q.S.C. (Vodafone Qatar)". ^ "Congo Brazzaville". TeleGeography. 2011-10-26. Retrieved 2014-08-13. ^ "Orange Reunion unveils HSPA+, DC-HSDPA". TeleGeography. 2013-12-10. Retrieved 2014-08-13. ^ "SRR linked with Aug-13 DC-HSDPA launch". TeleGeography. 2013-07-05. Retrieved 2014-08-13. ^ "Airtel Rwanda announces HSPA+ switch-on". TeleGeography. 2012-07-05. Retrieved 2014-08-13. ^ "Tigo Senegal reports improved network". TeleGeography. 2013-09-05. Retrieved 2014-08-13. ^ "3G calling for Seychelles". TeleGeography. 2006-12-12. Retrieved 2014-08-17. ^ "Airtel launches 3G network in main cities". TeleGeography. 2012-02-09. Retrieved 2014-08-17. ^ "Mobily launches HSDPA service in Saudi Arabia". Telecompaper. 2006-06-27. Retrieved 2014-08-24. ^ "Mobily launches HSPA+". TeleGeography. 2010-01-11. Retrieved 2014-08-13. ^ "3G switch-on for STC". TeleGeography. 2006-06-08. Retrieved 2014-08-24. ^ "STC and Novatel launch joint dual-carrier HSPA+ network". TeleGeography. 2011-01-27. Retrieved 2014-08-13. ^ "MTN to launch 3G this weekend". TeleGeography. 2005-06-24. Retrieved 2014-08-17. ^ "MTN ups HSPA+ coverage". TeleGeography. 2010-06-01. Retrieved 2014-08-13. ^ "Vodacom launches 3G: throws down gauntlet with video calls deal". TeleGeography. 2004-12-21. Retrieved 2014-08-17. ^ "Vodacom South Africa launches HSPA+ network". Telecoms.com. 2011-04-18. Retrieved 2014-08-13. ^ "Sudatel launches HSDPA network". TeleGeography. 2009-11-11. Retrieved 2014-08-17. ^ "Tigo Tanzania launches mobile internet service". Telecompaper. 2011-01-20. Retrieved 2014-08-17. ^ "Tigo launches 3.5G network". TeleGeography. 2013-05-14. Retrieved 2014-08-13. ^ "Vodacom HSDPA data card service goes live". 2007-02-25. Retrieved 2014-08-17. ^ "Zantel unveils 3G/3.5G for Zanzibar". TeleGeography. 2012-05-10. Retrieved 2014-08-17. ^ "Tunisiana launches 3G services". Telecompaper. 2012-07-25. Retrieved 2014-05-05. ^ "Tunisiana adopts Ooredoo brand". Telecompaper. 2014-04-28. Retrieved 2014-05-05. ^ "Tunisiana rounds out 3G trio". TeleGeography. 2012-07-24. Retrieved 2014-08-13. ^ "Orange Tunisia launches 3G network". TeleGeography. 2010-05-05. Retrieved 2014-08-17. ^ "3G launches in Turkey". TeleGeography. 2009-07-30. Retrieved 2014-08-24. ^ "Turkcell confirms 3C-HSDPA integration in 81 cities; cellco plots 2015 LTE launch". TeleGeography. 2015-01-02. Retrieved 2015-01-02. ^ "Turkcell to introduce Dual Carrier technology; 3G speeds set to double". TeleGeography. 2010-12-03. Retrieved 2016-03-24. ^ "Airtel launches HSPA+ nationwide". TeleGeography. 2012-08-14. Retrieved 2014-08-17. ^ "MTN Uganda launches 3G+ network". Telecompaper. 2010-08-04. Retrieved 2014-08-17. ^ "MTN upgrades network to meet rising demand". TeleGeography. 2012-11-14. Retrieved 2014-08-27. ^ "MTN activates DC-HSDPA upgrade". TeleGeography. 2013-03-18. Retrieved 2014-08-13. ^ "UTL launches 3G network in time for Commonwealth Conference". TeleGeography. 2007-11-27. Retrieved 2014-08-17. ^ "Du Due". TeleGeography. 2007-02-06. Retrieved 2014-08-24. ^ "Du showcases DC HSPA+ data card". TeleGeography. 2010-10-18. Retrieved 2014-08-13. ^ "Etisalat unveils 3G brand". TeleGeography. 2004-01-26. Retrieved 2014-08-24. ^ "Etisalat deploys HSPA+ at Burj Dubai". Telecompaper. 2010-01-05. ^ "Etisalat upgrades HSPA network to 42Mbps". Telecompaper. 2010-10-20. Retrieved 2014-08-13. ^ "Airtel Zambia inaugurates commercial HSPA+ services". TeleGeography. 2012-01-18. Retrieved 2014-08-17. ^ "MTN Zambia launches 3G, Edge services". Telecompaper. 2011-03-02. Retrieved 2014-08-17. ^ "MTN Zambia enhances mobile broadband speeds". TeleGeography. 2013-10-14. Retrieved 2014-08-13. ^ "Zamtel Mobile launches 3G network". TeleGeography. 2012-02-10. Retrieved 2014-08-17. ^ "Econet launches 3G". TeleGeography. 2009-09-01. Retrieved 2014-08-17. ^ "MTN Ghana announces launch of HSDPA service". TeleGeography. 2009-02-02. Retrieved 2014-08-17. ^ "MTN Ghana, Huawei deploy UMTS900 network; claim a first for Africa". TeleGeography. 2010-01-14. Retrieved 2014-08-17. ^ "Airtel Malawi embarks on a nationwide network upgrade project". TeleGeography. 2017-02-13. Retrieved 2017-02-13. ^ "TNM rolls out 3G in 900MHz band". TeleGeography. 2018-04-03. Retrieved 2018-04-03. ^ "Oman gets commercial 3G from Nawras". TeleGeography. 2007-12-10. Retrieved 2014-08-24. ^ "Nawras activates 900MHz 3.5G service in new cities". TeleGeography. 2014-05-15. Retrieved 2014-05-15. ^ "MTN set to launch commercial 3G services". TeleGeography. 2009-07-30. Retrieved 2018-01-28. ^ "MTN to expand Rwanda 3G network". TeleGeography. 2018-01-26. Retrieved 2018-01-28. ^ "Cell C Launches Africa's First HSPA+ 900 Network". cellular-news. 2010-09-06. Retrieved 2014-08-17. ^ "ZTE Deploys 42Mbps Mobile Broadband Network in South Africa". cellular-news. 2011-05-24. Retrieved 2014-08-13. ^ "Zain launches 7Mbps mobile internet service". TeleGeography. 2008-12-23. Retrieved 2014-08-17. ^ "Airtel rolls out 3G in 900MHz band". TeleGeography. 2011-11-10. Retrieved 2017-11-11. ^ "Digicel launches nation's first HSPA+ network". TeleGeography. 2013-06-03. Retrieved 2014-08-13. ^ "SETAR launches HSDPA service with Alca-Lu help". TeleGeography. 2007-12-11. Retrieved 2014-08-13. ^ "LIME launches HSPA+ in Antigua and Barbuda; sets October LTE date". TeleGeography. 2014-05-20. Retrieved 2014-08-13. ^ "Digicel Barbados launches HSPA+". TeleGeography. 2011-11-25. Retrieved 2014-08-13. ^ a b c "LIME claims '4G' HSPA+ launch in BVI". TeleGeography. 2012-07-03. Retrieved 2014-08-13. ^ "CellularOne announces Bermuda's first 4G network with data speeds up to six times faster" (pdf). CellularOne. 2011-01-25. Retrieved 2014-08-13. ^ "Digicel launches HSPA+ wireless service". TeleGeography. 2010-07-26. Retrieved 2014-08-13. ^ "Digicel confirms 16 November for HSPA+ launch". TeleGeography. 2012-11-15. Retrieved 2014-08-13. ^ "Digicel launches HSPA+ services in Cayman Islands". Telecompaper. 2011-10-15. Retrieved 2014-08-13. ^ "ETECSA launches 3G pilot in Santiago de Cuba". TeleGeography. 2017-04-25. Retrieved 2017-05-30. ^ "Cuba's pilot 3G service expanded to Camaguey". TeleGeography. 2017-05-30. Retrieved 2017-05-30. ^ "ETECSA prepares for national 3G rollout". TeleGeography. 2018-03-05. Retrieved 2018-03-05. ^ "Cuba opens up mobile internet access to select customers". TeleGeography. 2018-07-18. Retrieved 2018-07-18. ^ "ETECSA officially launches 3G internet for Cubans". TeleGeography. 2018-12-06. Retrieved 2018-12-06. ^ "Digicel Dominica launches HSPA+ network". telecompaper. 2015-02-13. Retrieved 2016-05-23. ^ "LIME - The first to introduce 4G technology to Dominica". Dominica News Online. 2014-10-10. Retrieved 2016-05-23. ^ "Orange Dominicana set to launch 3G next month". TeleGeography. 2010-01-29. Retrieved 2014-08-13. ^ "Digicel rolls out HSPA+ in Haiti". TeleGeography. 2013-05-20. Retrieved 2014-08-13. ^ "Digicel launches HSPA+ network". TeleGeography. 2012-06-28. Retrieved 2017-06-13. ^ "Digicel to shut down Claro network". TeleGeography. 2012-01-13. Retrieved 2017-08-24. ^ "LIME refreshes wireless sector with '4G' rollout". TeleGeography. 2012-03-13. Retrieved 2017-06-13. ^ "LIME launches 3G". TeleGeography. 2009-06-24. Retrieved 2017-08-24. ^ "Digicel opens big with launch of 4G services in Montserrat". The Montserrat Reporter Newspaper. 2015-01-09. Retrieved 2016-04-25. ^ "Lime gives Montserrat a Christmas UPGRADE as it launches first Mobile 4G on Island". The Montserrat Reporter Newspaper. 2014-12-19. Retrieved 2016-04-25. ^ "Digicel launches '4G' in SKN". TeleGeography. 2013-04-26. Retrieved 2014-08-13. ^ "LIME St. Kitts and Nevis Goes '4G'". National Broadcasting Corporation of St. Kitts & Nevis. 2012-10-04. ^ "Digicel launches HSPA+ in Saint Lucia". TeleGeography. 2014-05-20. Retrieved 2014-08-13. ^ "LIME Saint Lucia launches HSPA+". TeleGeography. 2013-07-08. Retrieved 2014-08-13. ^ "Digicel Suriname launches HSPA+ network". TeleGeography. 2014-04-08. Retrieved 2014-08-13. ^ "This is not just any '4G', this is TSTT '4G'". TeleGeography. 2012-11-14. Retrieved 2014-08-13. ^ "Digicel T&T launches HSPA+". TeleGeography. 2012-05-22. Retrieved 2014-08-13. ^ "Digicel prepares to launch HSPA+, joining Islandcom". TeleGeography. 2012-11-22. Retrieved 2014-08-13. ^ "Turks and Caicos gets new 3G operator". TeleGeography. 2010-06-28. Retrieved 2014-08-13. ^ "Bahamas Telecom Sees Surge in Mobile Data Traffic Following HSPA+ Upgrade". cellular-news. 2012-10-02. Retrieved 2014-08-13. ^ a b c "Orange introduces HSPA+ in Cayenne". TeleGeography. 2014-01-02. Retrieved 2014-08-13. ^ a b "Bell's HSPA services launched, Telus follows today". TeleGeography. 2009-11-05. Retrieved 2014-08-13. ^ "Bell's 21Mbps HSPA+ due in Nov.; iPhone imminent?". Electronista. 2009-10-05. Retrieved 2014-08-13. ^ "Bell Mobility launches Dual-Cell HSPA+ in North America". Telecompaper. 2010-11-19. Retrieved 2014-08-13. ^ "Shepherd hopes MTS users flock to HSPA+ network". TeleGeography. 2010-02-03. Retrieved 2014-08-13. ^ "Globalive's launch puts the Wind up incumbents". TeleGeography. 2009-12-17. Retrieved 2014-08-13. ^ "Mobilicity switches on 21Mbps services". TeleGeography. 2012-11-01. Retrieved 2014-08-13. ^ "Rogers launches HSDPA network in Golden Horseshoe area". Telecompaper. 2006-11-02. Retrieved 2014-08-13. ^ "Rogers launches HSPA+ in five cities". TeleGeography. 2009-09-15. Retrieved 2014-08-13. ^ "SaskTel launches HSPA across 16 communities". TeleGeography. 2010-08-17. Retrieved 2014-08-13. ^ "SaskTel's HSPA+ wireless network "is now classified as 4G"". Mobile Syrup. 2011-03-11. Retrieved 2014-08-13. ^ "Telus to launch commercial HSPA+ services with iPhone 3GS on 5 November". TeleGeography. 2009-10-27. ^ "Telus launching DC-HSDPA in March". TeleGeography. 2011-02-09. Retrieved 2014-08-13. ^ "Videotron launches HSPA+ network in Quebec". Telecompaper. 2010-09-10. Retrieved 2014-08-13. ^ "Videotron launches 42 Mbps mobile internet offer". Telecompaper. 2011-08-26. Retrieved 2014-08-13. ^ "DOCOMO PACIFIC LAUNCHES FASTER DATA SPEEDS WITH HSPA+". DoCoMo Pacific. 2011-11-10. Retrieved 2014-08-13. ^ "Guam Network Upgraded to HSPA+ Service". cellular-news. 2011-07-21. Retrieved 2014-08-13. ^ "iConnect unveils new HSPA+/LTE network". TeleGeography. 2014-09-04. Retrieved 2014-09-04. ^ a b "IT&E unveils improved mobile data network". TeleGeography. 2014-07-15. Retrieved 2014-08-13. ^ "DOCOMO Pacific launches 3G in Saipan". TeleGeography. 2014-07-11. Retrieved 2014-07-15. ^ "AT&T Begins Posting 4G HSPA+ Coverage". iClarified. 2011-02-19. Retrieved 2014-08-13. ^ "Claro Puerto Rico complete 4G network deployment". Telecompaper. 2011-02-11. Retrieved 2014-08-13. ^ "San Juan, Ponce get 42Mbps HSPA+ coverage from T-Mobile". TeleGeography. 2011-05-25. Retrieved 2014-08-13. ^ "Alaska Communications to launch LTE in Anchorage, Fairbanks and Juneau". TeleGeography. 2012-10-04. Retrieved 2014-08-13. ^ "AT&T now covers 80% of its network with HSPA+". FierceWireless. 2010-11-17. Retrieved 2014-08-13. ^ "HSPA+ Network Launched by Regional US Cable Operator". cellular-news. 2009-12-16. Retrieved 2014-08-13. ^ "HSPA+ hullabaloo as Cincinnati Bell claims to launch '4G'". TeleGeography. 2011-07-07. Retrieved 2014-08-13. ^ "Broadband Grant for Isolated Southeastern Oklahoma/Choctaw Nation - Rural/ Non-Remote Areas". National Telecommunications and Information Administration (NTIA). Retrieved 2014-02-20. ^ "Supported T-Mobile networks". 2016-07-27. Retrieved 2016-09-14. ^ "T-Mobile USA Expands its 4G Network to Cover 200 Million People". cellular-news. 2011-04-05. Retrieved 2014-08-13. ^ a b c "3G launch for CTI Movil". TeleGeography. 2007-11-13. Retrieved 2014-08-13. ^ "Claro Argentina introduces HSPA+ services". TeleGeography. 2011-11-03. Retrieved 2014-08-13. ^ "Digicell 4G Opens Up New Avenues". Guardian Belize. 2013-04-04. Archived from the original on 2015-09-24. Retrieved 2015-08-01. ^ "Entel Movil upgrades network with HSPA+; LTE trials underway". TeleGeography. 2011-04-11. Retrieved 2014-08-13. ^ "3G Network Launched in Bolivia". cellular-news. 2008-08-28. Retrieved 2014-08-13. ^ "CTBC launches 3G". TeleGeography. 2008-04-11. Retrieved 2014-11-26. ^ "AM to launch 3G mobile services in Brazil". TeleGeography. 2011-11-14. Retrieved 2014-11-26. ^ "Brazilian carriers start HSPA+ migration; Claro launches its networks". RCR Wireless News. 2011-12-16. Retrieved 2014-08-13. ^ "Nextel to launch 4G in Rio by World Cup". Telecompaper. 2014-04-30. Retrieved 2014-05-01. ^ "TIM Brasil launches 3G in six state capitals; awards Ericsson deal for W-CDMA/HSPA kit". TeleGeography. 2008-04-17. Retrieved 2014-08-13. ^ "TIM Brasil to launch HSPA+". TeleGeography. 2010-01-10. Retrieved 2014-08-13. ^ "TIM Brasil upgrades 3G coverage in São Paulo". Telecompaper. 2014-12-19. Retrieved 2018-06-02. ^ "Vivo rolls out HSPA+ in Sao Paulo". TeleGeography. 2011-11-23. Retrieved 2014-08-13. ^ "Chile's Entel launches HSPA+ network with Ericsson". Telecompaper. 2011-07-13. Retrieved 2014-08-13. ^ "Movistar inks deal with NSN for HSPA+". TeleGeography. 2010-08-27. Retrieved 2014-08-13. ^ "Comcel launches HSPA+ network in Colombia". Telecompaper. 2011-11-25. Retrieved 2014-08-13. ^ "Movistar launches 3G network". TeleGeography. 2008-12-03. Retrieved 2014-11-26. ^ "Movistar launches 4G HSPA+ network in Colombia". Telecompaper. 2012-10-19. Retrieved 2014-08-13. ^ "Movistar launches HSPA+ in Quito". TeleGeography. 2011-08-22. Retrieved 2014-08-13. ^ "Claro lanza tecnología 4G para sus clientes" (in Spanish). El Mundo. 2012-02-06. Archived from the original on 2014-08-13. Retrieved 2014-08-13. ^ "Digicel launches HSPA+ in El Salvador". Telecompaper. 2014-01-16. Retrieved 2014-08-13. ^ "¿Qué necesito para tener el nuevo servicio de 4G?" (in Spanish). Digicel. Archived from the original on 2014-08-13. Retrieved 2014-08-13. ^ "Conéctate con el nuevo 4G de Tigo" (in Spanish). La Prensa Gráfica. 2012-01-29. Archived from the original on 2014-08-13. Retrieved 2014-08-13. ^ a b "Telefónica invierte US$15 millones en tecnología 4G" (in Spanish). Prensa Libre. 2011-12-14. Archived from the original on 2011-12-15. Retrieved 2014-08-13. ^ "Tigo lanzó cobertura 4G en Guatemala" (in Spanish). AméricaEconomía. 2012-01-05. Archived from the original on 2014-08-13. Retrieved 2014-08-13. ^ "Digicel launches 4G in Guyana". Stabroek News. 2016-05-08. Retrieved 2016-05-24. ^ "GT&T launches 4G service". Stabroek News. 2016-05-09. Retrieved 2016-05-24. ^ "Claro launches Honduran 3G service". TeleGeography. 2008-02-19. Retrieved 2014-08-13. ^ "MIC launches Honduran 3G service". TeleGeography. 2008-09-02. Retrieved 2014-08-13. ^ "Tigo lanza la red móvil 4G" (in Spanish). Catracho Cell. 2012-02-03. Retrieved 2014-08-13. ^ "Telcel launches 3G". TeleGeography. 2008-02-08. Retrieved 2014-11-26. ^ "Nextel de Mexico on brink of national 3G launch". TeleGeography. 2012-09-25. Retrieved 2014-08-13. ^ "Claro ofrece internet 4G" (in Spanish). El Nuevo Diario. 2012-05-10. Retrieved 2014-08-13. ^ "Cable & Wireless set to launch HSPA+ in Panama". RCR Wireless News. 2011-08-25. Retrieved 2014-08-13. ^ "HSPA+ service launched by Claro". TeleGeography. 2011-08-19. Retrieved 2014-08-13. ^ "Digicel launches HSPA+ services in Panama". Telecompaper. 2011-11-25. Retrieved 2014-08-13. ^ "Telefonica Moviles Panama launches 3G". TeleGeography. 2008-12-08. Retrieved 2014-11-26. ^ "Claro to launch HSPA+ this week". TeleGeography. 2011-11-07. Retrieved 2014-08-13. ^ "Personal presentó su red Dual Carrier HSPA+ en Paraguay" (in Spanish). TeleSemana. 2012-02-07. Retrieved 2014-08-13. ^ "Claro upgrades to HSPA+". TeleGeography. 2011-11-18. Retrieved 2014-08-13. ^ "Movistar plans 3G launch for year end". TeleGeography. 2008-07-15. Retrieved 2014-07-26. ^ "USUARIOS DE MOVISTAR EN PERÚ YA DISPONEN DE TECNOLOGÍA 4G" (pdf) (in Spanish). Telefónica. 2011-11-18. Retrieved 2014-08-13. ^ "Nextel to launch 3G network tomorrow". TeleGeography. 2009-12-14. Retrieved 2014-07-26. ^ "VIETTEL IN PERU". viettelglobal.vn. 2014-10-15. Retrieved 2018-08-08. ^ "Digicel Suriname launches HSPA+ network". TeleGeography. 2014-04-08. Retrieved 2014-11-26. ^ "Ancel reduces tariffs and launches 3G". Telecompaper. 2007-07-18. Retrieved 2014-08-13. ^ "Porque la velocidad importa" (PDF) (in Spanish). Claro. 2011-11-01. Archived from the original (pdf) on 2013-05-27. Retrieved 2014-08-13. ^ "Digitel launching 900MHz 3G/3.5G in two phases; begins with HSDPA USB modems". TeleGeography. 2009-03-05. Retrieved 2014-07-26. ^ "Movistar launches HSPA". TeleGeography. 2008-12-12. Retrieved 2014-07-26. ^ "2012年11月からLTEを100Mに増速---NTTドコモ" (in Japanese). ITpro. 2013-01-08. Retrieved 2016-12-26. ^ "Technology - Evolution of the mobile communication network - HSPA (High Speed Packet Access)". NTT DoCoMo. Retrieved 2016-12-26. ^ "DoCoMo to launch HSUPA service in June". TeleGeography. 2009-04-30. Retrieved 2016-12-26. ^ "NTT DoCoMo Technical Journal Vol. 8 No.2 - Multiband Mobile Terminals" (PDF). NTT DoCoMo. 2007-01-31. Retrieved 2016-12-26. ^ "DoCoMo downgraded on slow 3G take-up". TeleGeography. 2003-01-08. Retrieved 2016-12-25. ^ "プレスリリース 2015年 - LTEサービスの拡大および一部の3Gサービス終了について" (in Japanese). Softbank. 2015-12-11. Retrieved 2016-12-30. ^ "Ericsson to deploy 900MHz HSPA network for Softbank". TeleGeography. 2012-03-22. Retrieved 2016-12-25. 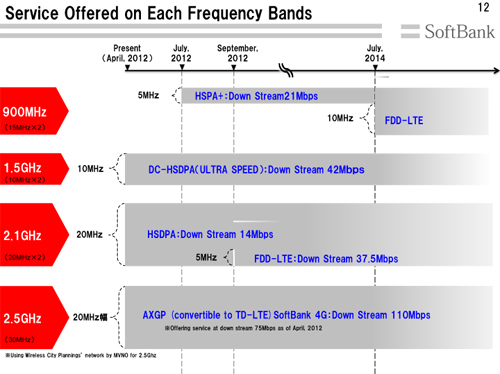 ^ "Softbank contracts NSN for LTE rollout and HSPA+ expansion". TeleGeography. 2012-04-16. Retrieved 2016-12-25. ^ "Softbank announces interim higher speed 3G network "Ultraspeed"". Japan Mobile Tech. 2010-11-09. Retrieved 2016-12-30. ^ "Softbank launches dual-carrier HSDPA network". TeleGeography. 2010-11-04. Retrieved 2016-12-25. ^ "eMobile, Ericsson launch HSPA+". TeleGeography. 2009-09-03. Retrieved 2016-12-25. ^ "eMobile, Huawei launch HSPA+ network – a first for Japan". TeleGeography. 2009-08-06. Retrieved 2016-12-25. ^ "eMobile opens doors to customers". TeleGeography. 2007-03-02. Retrieved 2016-12-26. ^ "eMobile to launch mobile phone service on 31 March". TeleGeography. 2007-02-19. Retrieved 2016-12-26. ^ "Softbank to complete USD15 billion Vodafone acquisition". TeleGeography. 2006-03-20. Retrieved 2016-12-25. ^ "eAccess unit selects Ericsson for W-CDMA/HSDPA network". TeleGeography. 2006-03-13. Retrieved 2016-12-26. ^ "Vodafone wins 1.7GHz W-CDMA licence". TeleGeography. 2005-07-07. Retrieved 2016-12-26. ^ "J-Phone to rebrand as Vodafone". TeleGeography. 2003-09-08. Retrieved 2016-12-25. ^ "J-Phone launches 3G – key features missing". TeleGeography. 2002-12-20. Retrieved 2014-08-18. ^ "ArmenTel receives 3G frequencies". TeleGeography. 2007-10-08. Retrieved 2014-08-21. ^ "Armenian Armentel intends to expand its 3g network". ARKA NEWS AGENCY. 2009-04-23. Retrieved 2014-08-21. ^ "Orange launches Armenia's third mobile network". TeleGeography. 2009-11-06. Retrieved 2014-08-21. ^ "Orange Armenia launches DC-HSDPA network in three cities". TeleGeography. 2012-01-25. Retrieved 2014-08-13. ^ "VivaCell launches 3G/HSPA network". TeleGeography. 2009-04-20. Retrieved 2014-08-21. ^ "VivaCell launches HSPA+ services in Yerevan". Telecompaper. 2011-03-07. Retrieved 2014-08-13. ^ "VivaCell-MTS expands DC-HSDPA coverage to 86% of the population". TeleGeography. 2014-02-10. Retrieved 2014-08-13. ^ "Azercell launches 3G services". TeleGeography. 2011-11-21. Retrieved 2014-08-21. ^ "Azerfon launches 3G, unveils new Azerfon-Vodafone brand". TeleGeography. 2009-12-17. Retrieved 2014-08-21. ^ "Third cellco launches 3G; Azercell applies for 4G licence". TeleGeography. 2011-11-25. Retrieved 2014-08-21. ^ "Banglalink launches commercial 3G packages; Airtel starts 3G trial". TeleGeography. 2013-10-11. Retrieved 2014-08-13. ^ "Robi's 3G network goes commercial". TeleGeography. 2013-10-31. Retrieved 2014-08-13. ^ "Bhutan gets first 3G services". TeleGeography. 2008-05-07. Retrieved 2014-08-18. ^ "B-Mobile to launch 3G services". Telecompaper. 2005-08-31. Retrieved 2014-08-18. ^ "Cambodia gets 3G minus video". TeleGeography. 2006-10-03. Retrieved 2014-08-18. ^ "Cambodia's Smart Mobile switches on HSPA+ network". TeleGeography. 2011-08-03. Retrieved 2014-08-13. ^ "Digicel Fiji HSDPA network now live in Lautoka". TeleGeography. 2014-08-06. Retrieved 2016-12-24. ^ "Vodafone Fiji launches 3G network". TeleGeography. 2008-11-19. Retrieved 2016-12-24. ^ "Vodafone Fiji sets out plans to upgrade 75 base stations to 4G+". TeleGeography. 2016-07-04. Retrieved 2016-12-24. ^ "Geocell unveils HSPA+ network". TeleGeography. 2012-07-04. Retrieved 2014-08-13. ^ "Hutch bows in and bows out". TeleGeography. 2004-01-29. Retrieved 2014-08-18. ^ "2010 Annual Report" (pdf). Hutchison Telecommunications Hong Kong Holdings Limited. 2011-03-21. p. 16. Retrieved 2014-08-13. ^ "Aircel inaugurates 3G offering in Chennai, ten more circles due for launch within a week". TeleGeography. 2011-02-23. Retrieved 2014-08-18. ^ "Another one gone: Aircel files for bankruptcy". TeleGeography. 2018-03-01. Retrieved 2018-03-01. ^ "Creditors scrap over Aircel, RCOM debts; Airtel/Telenor merger gets thumbs up". TeleGeography. 2018-03-09. Retrieved 2018-03-10. ^ "Bharti announces 3G plans; launches in Karnataka". TeleGeography. 2011-01-24. Retrieved 2014-08-18. ^ "BSNL to offer 3G services in 760 cities at end of first deployment phase". TeleGeography. 2009-08-10. Retrieved 2014-08-18. ^ "As Idea launches commercial 3G services, is a spectrum sharing deal with Bharti and Vodafone Essar close?". TeleGeography. 2011-03-28. Retrieved 2014-08-18. ^ "MTNL soft-launches 3G". TeleGeography. 2008-12-12. Retrieved 2014-08-18. ^ "MTNL to spend USD62m on Delhi network expansion". TeleGeography. 2017-03-31. Retrieved 2017-03-31. ^ "Telkomsel launches commercial 3G service". TeleGeography. 2006-09-15. Retrieved 2014-08-18. ^ "2009 Annual Report" (pdf). Telkomsel. 2010-03-12. p. 29. Retrieved 2014-08-13. ^ "Excel's 3G network goes live; government warns others to meet launch deadline". TeleGeography. 2006-09-22. Retrieved 2014-08-18. ^ "Kcell Annual Report 2013" (pdf). Kcell. 2014-04-30. p. 25. Retrieved 2014-08-13. ^ "Sky Mobile widens 3.5G footprint". TeleGeography. 2013-09-26. Retrieved 2014-08-13. ^ "Go O! Nur Telecom launches 4G". TeleGeography. 2014-05-12. Retrieved 2017-01-29. ^ "O! 3G expansion in Talas!". TeleGeography. 2014-12-10. Retrieved 2017-01-29. ^ "Beeline Lao 3G now in Luang Prabang and Savannakhet". The Retire-Asia Blog. 2012-03-22. Retrieved 2014-08-13. ^ "Laos gets its first 3G service". TeleGeography. 2008-10-20. Retrieved 2014-08-18. ^ "Hutch Macau launches 3.5G services". TeleGeography. 2007-10-17. Retrieved 2014-08-18. ^ "2011 Annual Report" (pdf). Hutchison Telecommunications Hong Kong Holdings Limited. 2012-03-20. p. 15. Retrieved 2014-08-13. ^ "Macau's CTM to launch 3G". TeleGeography. 2007-06-13. Retrieved 2014-08-18. ^ "SmarTone Macau 3G network goes live". TeleGeography. 2010-07-06. Retrieved 2014-08-18. ^ "Share Blazing-Fast Connections with Personal and Secure Mobile WiFi Wherever You Go" (pdf). Celcom. 2012-08-08. Retrieved 2014-08-13. ^ "Celcom enlists NSN for DC-HSDPA upgrade in Klang Valley". TeleGeography. 2011-06-14. Retrieved 2014-08-13. ^ "DiGi completes nationwide network modernisation programme". TeleGeography. 2013-10-29. Retrieved 2014-08-13. ^ "Maxis squares up to Celcom in 3G battle". TeleGeography. 2005-07-01. Retrieved 2014-08-18. ^ "Maxis Soft-Launches HSPA+ in Malaysia". cellular-news. 2009-12-30. Retrieved 2014-08-13. ^ "ANNUAL REPORT 2012" (pdf). Maxi. 2013-04-11. p. 63. Retrieved 2014-08-13. ^ "U Mobile reveals launch plans". TeleGeography. 2007-09-21. Retrieved 2014-08-18. ^ "U Mobile upgrades first base station with Dual Carrier HSPA+". TeleGeography. 2010-09-28. Retrieved 2014-08-13. ^ "Dhiraagu launches HSPA+". TeleGeography. 2013-04-25. Retrieved 2014-08-13. ^ "Ooredoo Maldives expands 3G+ coverage". Telecompaper. 2013-12-31. Retrieved 2014-08-13. ^ "MobiCom launches HSPA". TelGeography. 2009-04-28. Retrieved 2014-08-18. ^ "Myanmar Post and Telecommunication has upgraded their network". MPT official webpage. 2015-03-31. Retrieved 2015-09-24. ^ "Telenor to launch services in Myanmar on 27 September". Telecompaper. 2014-09-26. Retrieved 2014-09-26. ^ "NT announces 3G launch". TeleGeography. 2007-05-18. Retrieved 2014-08-18. ^ "North Korea Launches 3G Cellular Service". CIO. 2008-12-15. Retrieved 2014-08-18. ^ "Mobilink launches 3G services". TeleGeography. 2014-07-21. Retrieved 2014-08-18. ^ "Mobilink extends free 3G trial as reward for customers". TeleGeography. 2014-06-18. Retrieved 2014-08-13. ^ "Telenor launches Pakistan's second 3G network". TeleGeography. 2014-06-02. Retrieved 2014-08-18. ^ "Zong gearing up for 3G launch". TeleGeography. 2014-06-12. Retrieved 2014-08-18. ^ "Globe launches commercial HSDPA network". TeleGeography. 2006-05-04. Retrieved 2014-08-18. ^ "Globe Telecom Launches HSPA+ Based 4G Services". cellular-news. 2011-04-18. Retrieved 2014-08-13. ^ "Smart launches HSPA+ dongle". Telecompaper. 2011-08-05. Retrieved 2014-08-13. ^ "M1 launches consumer 3G services". Telecompaper. 2005-02-17. Retrieved 2014-08-18. ^ "M1 to upgrade HSPA+ network with Huawei". Telecompaper. 2009-10-01. Retrieved 2014-08-13. ^ "SingTel expands LTE network nationwide". Telecompaper. 2013-04-23. Retrieved 2014-08-13. ^ "StarHub pulls off high-speed double". TeleGeography. 2005-04-26. Retrieved 2014-08-18. ^ "StarHub's commercial HSPA+ goes live". TeleGeography. 2009-07-16. Retrieved 2014-08-13. ^ "StarHub to launch its enhanced mobile broadband network and smartphone price plans on 19 September 2012". StarHub. 2012-09-12. Retrieved 2014-08-13. ^ "SK Telecom to launch 3G on 29 December". TeleGeography. 2003-12-15. Retrieved 2014-08-18. ^ "SK Telecom Plans LTE Launch in 2011". cellular-news. 2010-07-14. Retrieved 2014-08-13. ^ "Airtel Lanka reaches 'all regions' with 3G". TeleGeography. 2013-01-11. Retrieved 2014-08-13. ^ "Dialog wastes no time in launching 3G". TeleGeography. 2006-08-16. Retrieved 2014-08-18. ^ "Etisalat Sri Lanka launches commercial DC-HSDPA services". TeleGeography. 2012-09-14. Retrieved 2014-08-13. ^ "Hutch Lanka launches 3G". TeleGeography. 2012-04-23. Retrieved 2014-08-18. ^ "Mobitel's 3.5G service launches". TeleGeography. Retrieved 2014-08-18. ^ "Mobitel Upgrades Network with Dual-Carrier HSPA+ Capacity". cellular-news. 2012-12-14. Retrieved 2014-08-13. ^ "Tacom launches 3G". TeleGeography. 2006-11-07. Retrieved 2014-08-18. ^ "TOT's 3G network splutters into life". TeleGeography. 2009-12-04. Retrieved 2014-08-18. ^ "TOT picks NSN for 3G network upgrade". Telecompaper. 2012-04-11. Retrieved 2014-08-13. ^ "TCC launches 3G network in Tonga". TeleGeography. 2014-01-03. Retrieved 2016-12-24. ^ "Ucell launches DC-HSDPA". TeleGeography. 2013-08-06. Retrieved 2014-08-13. ^ "MobiFone second in 3G race; Viettel expands trial service". TeleGeography. 2009-12-17. Retrieved 2014-08-18. ^ "MobiFone installs 7,500 additional base stations". Telecompaper. 2012-04-13. Retrieved 2014-08-13. ^ "Vietnamobile becomes fifth 3G service provider". TeleGeography. 2011-12-05. Retrieved 2014-08-18. ^ "Vietnamobile launches 3G services". Telecompaper. 2011-12-05. Retrieved 2014-08-13. ^ "Viettel third to launch 3G". TeleGeography. 2010-03-26. Retrieved 2014-08-18. ^ "VinaPhone khẳng định vị trí tiên phong" (in Vietnamese). Vinaphone. 2012-06-26. Retrieved 2014-08-13. ^ a b c d e f g "spectrummonitoring.com - Frequencies ITU Region 3". spectrummonitoring.com. 2014-11-06. Retrieved 2016-12-22. ^ "Optus to up 3G coverage to 98%". TeleGeography. 2008-05-07. Retrieved 2016-12-22. ^ "Optus Mobile ups HSDPA ante". TeleGeography. 2007-12-13. Retrieved 2016-12-22. ^ "Optus to boost 3G coverage to match 2G". TeleGeography. 2007-01-30. Retrieved 2016-12-22. ^ "Optus launches 3G network". TeleGeography. 2005-04-27. Retrieved 2016-12-22. ^ a b "Optus and Vodafone form 3G alliance". TeleGeography. 2004-11-19. Retrieved 2016-12-22. ^ a b "Another Aussie 3G network sharing deal". TeleGeography. 2004-08-26. Retrieved 2016-12-22. ^ "Telstra prompts customers to check device compatibility as it prepares to switch off 2100MHz 3G network". TeleGeography. 2012-08-01. Retrieved 2016-12-22. ^ "Telstra and Vodafone Hutchison to scrap mobile joint venture in August 2012". TeleGeography. 2010-10-21. Retrieved 2016-12-22. ^ "Telstra boosts theoretical HSPA+ speed to 42Mbps". TeleGeography. 2010-02-16. Retrieved 2016-12-22. ^ "Telstra boosts speeds on NextG network". TeleGeography. 2009-02-18. Retrieved 2014-08-13. ^ "Telstra says NEXTG network share is a no-no". TeleGeography. 2006-11-07. Retrieved 2016-12-23. ^ "Telstra launches AUD1 billion HSDPA network ahead of schedule". TeleGeography. 2006-10-06. Retrieved 2016-12-23. ^ "Telstra launches 3G". TeleGeography. 2005-09-06. Retrieved 2016-12-22. ^ a b "Telstra and Hutchison sign 3G deal". TeleGeography. 2004-12-06. Retrieved 2016-12-23. ^ "Vodafone Australia to refarm 850MHz spectrum for 4G". TeleGeography. 2014-07-30. Retrieved 2016-12-24. ^ "Vodafone inaugurates DC-HSPA+ in seven locations". TeleGeography. 2012-09-13. Retrieved 2016-12-22. ^ "VHA to launch LTE by end-2011? Upgrade project begun". TeleGeography. 2011-04-15. Retrieved 2016-12-23. ^ "VHA unveils network upgrade, expansion plans". TeleGeography. 2010-10-25. Retrieved 2016-12-23. ^ "Vodafone boosts 3G coverage to 94%". TeleGeography. 2009-09-01. Retrieved 2016-12-22. ^ "Vodafone and Hutchison complete merger". TeleGeography. 2009-06-10. Retrieved 2016-12-22. ^ "Vodafone 3G network about to expand; aims for 94% coverage by August 2009". TeleGeography. 2009-04-30. Retrieved 2016-12-22. ^ "Vodafone's 900MHz 3G network to launch in May". TeleGeography. 2009-03-26. Retrieved 2016-12-22. ^ "Vodafone to build solo 3G network". TeleGeography. 2007-12-12. Retrieved 2016-12-22. ^ "Hutch fast tracks HSDPA following Telstra and Vodafone launches". TeleGeography. 2006-10-24. Retrieved 2016-12-23. ^ "Vodafone launches 3G". TeleGeography. 2005-11-01. Retrieved 2016-12-22. ^ "3 goes live down under". TeleGeography. 2003-04-15. Retrieved 2016-12-23. ^ "Bhutan gets first 3G services". TeleGeography. 2008-05-07. Retrieved 2018-01-09. ^ "Bhutan Telecom switches 3G network from 2100MHz to 850MHz in Gelephu". TeleGeography. 2015-01-06. Retrieved 2018-01-09. ^ "TashiCell to launch HSPA+ network on 3 December". TeleGeography. 2013-12-02. Retrieved 2014-08-18. ^ "China Unicom launches 3G services officially". Telecompaper. 2009-10-05. Retrieved 2014-08-18. ^ "拟新建1.9万U900基站 联通将3G进行到底". C114中国通信网. 2014-10-09. Retrieved 2014-10-09. ^ "Unicom to roll out HSPA+ in 56 cities". TeleGeography. 2011-03-29. Retrieved 2014-08-13. ^ "Guangdong Unicom upgrades 3G WCDMA network to attain 42 Mbps". Telecompaper. 2013-10-30. Retrieved 2014-08-13. ^ "It never rains but it pours! Two new 3G networks launched pre-Christmas". TeleGeography. 2004-12-20. Retrieved 2014-08-18. ^ "CSL's HSPA+ network goes commercial". TeleGeography. 2009-03-31. Retrieved 2014-08-13. ^ "Huawei Deploys Dual Carrier HSPA+ Upgrade in Hong Kong". cellular-news. 2010-08-25. Retrieved 2014-08-13. ^ Wang, Paul. "Hong Kong, China: The Case for LTE 2.6 / 1.8 GHz and DC-HSPA+" (pdf). GSMA. p. 6. Retrieved 2014-10-21. ^ "SmarTone announces 3G launch". TeleGeography. 2004-12-07. Retrieved 2014-08-18. ^ "SmarTone the latest HK cellco to launch HSPA+". TeleGeography. 2009-11-09. Retrieved 2014-08-13. ^ "SmarTone launches 28.8Mbps HSPA+ mobile broadband package". TeleGeography. 2010-04-20. Retrieved 2014-08-13. ^ "SmarTone, Hutch 850/900MHz operations get OFTA flying start". TeleGeography. 2011-03-04. Retrieved 2018-01-09. ^ "Indosat launches HSDPA with upgrade from Nokia, Ericsson". Telecompaper. 2006-11-29. Retrieved 2014-08-18. ^ "Indosat upgrades HSPA network to 21 Mbps". Telecompaper. 2009-10-28. Retrieved 2014-08-13. ^ "Indosat selects NSN to enhance 3G network". Telecompaper. 2010-06-11. Retrieved 2014-08-13. ^ "Indosat launches 'Super Internet' service on UMTS-900 network". TeleGeography. 2013-09-19. Retrieved 2014-07-23. ^ "Megacom launches 3G network in Bishkek". TeleGeography. 2012-01-18. Retrieved 2017-01-29. ^ "Megacom to expand 3.5G coverage nationwide". TeleGeography. 2012-05-10. Retrieved 2017-01-29. ^ "Megacom upgrades to DC-HSPA+". TeleGeography. 2014-01-20. Retrieved 2017-01-29. ^ "Megacom expands 3G coverage, improves network capacity". TeleGeography. 2015-05-14. Retrieved 2017-01-29. ^ "MegaCom adding UMTS-900 services to 3G/4G line-up". TeleGeography. 2017-01-23. Retrieved 2017-01-29. ^ "3G arrives in Rangoon". TeleGeography. 2008-07-08. Retrieved 2018-01-09. ^ "Ooredoo plans 3G-only strategy". TeleGeography. 2013-10-23. Retrieved 2018-01-09. ^ "Ooredoo launch sees massive demand, cut cable impacts broadband speeds". TeleGeography. 2014-08-18. Retrieved 2018-01-09. ^ "Ooredoo enlists a million users in less than three weeks; MPT cuts costs". TeleGeography. 2014-08-26. Retrieved 2018-01-09. ^ "Telenor launches Myanmar's third mobile network". TeleGeography. 2014-09-29. Retrieved 2018-01-09. ^ a b c "Telecom eyes DC-HSPA+ launch by year-end". TeleGeography. 2012-10-04. Retrieved 2016-12-24. ^ "2degrees to launch 3G". TeleGeography. 2010-07-23. Retrieved 2016-12-24. ^ "2degrees to launch 3G in 2010; Telecom reviews LTE plans". TeleGeography. 2009-08-24. Retrieved 2016-12-24. ^ "Spark into life; Telecom NZ prepares for rebranding". TeleGeography. 2014-07-02. Retrieved 2016-12-24. ^ "Telecom New Zealand outlines LTE trial plans". TeleGeography. 2012-12-06. Retrieved 2016-12-24. ^ "Telecom and Vodafone roll out 3.5G". TeleGeography. 2009-06-01. Retrieved 2016-12-24. ^ "Telecom New Zealand announces 3G launch date". TeleGeography. 2009-04-27. Retrieved 2016-12-24. ^ "Telecom will retain exclusivity on new 850MHz network". TeleGeography. 2008-10-27. Retrieved 2016-12-24. ^ "Telecom unveils details of new 3G network". TeleGeography. 2008-10-15. Retrieved 2016-12-24. ^ "Telecom confirms W-CDMA deployment". TeleGeography. 2007-06-11. Retrieved 2016-12-24. ^ "Vodafone confirms that HSPA+ cell towers are live in Auckland and Wellington". TeleGeography. 2010-12-23. Retrieved 2016-12-24. ^ "Vodafone to introduce 28.8Mbps transfer speeds; RBI bid confirmed". TeleGeography. 2010-11-04. Retrieved 2016-12-24. ^ "Vodafone 3G network rollout sooner than expected". TeleGeography. 2009-02-19. Retrieved 2016-12-24. ^ "3G launch for Vodafone". TeleGeography. 2005-08-10. Retrieved 2016-12-24. ^ "Ufone gives 3G network a boost with refarmed spectrum". TeleGeography. 2017-01-26. Retrieved 2017-01-29. ^ "Ufone leads the 3G charge, Warid tests LTE". TeleGeography. 2014-05-27. Retrieved 2017-01-29. ^ "AIS launches 3G". TeleGeography. 2008-05-07. Retrieved 2014-08-18. ^ "AIS launches expanded 3G 900MHz service in capital and seven provinces". TeleGeography. 2011-07-29. Retrieved 2014-08-13. ^ "True 4G launch trumps rivals; AIS claims 800,000 users at official 2100MHz launch; DTAC waits until June". TeleGeography. 2013-05-09. Retrieved 2014-08-18. ^ "AIS to migrate remaining UMTS-900 users to 2100MHz 'in two months'". TeleGeography. 2013-07-11. Retrieved 2015-12-22. ^ "annual report 2011" (pdf). DTAC. 2012-02-06. p. 17. Retrieved 2014-08-13. ^ "DTAC launches TriNet 3G". Telecompaper. 2013-05-10. Retrieved 2014-08-18. ^ "CAT's formal launch of My 3G retail service confirmed for January". TeleGeography. 2012-01-03. Retrieved 2014-08-18. ^ "Vodafone launches 3G in Tirana". TeleGeography. 2011-01-11. Retrieved 2014-08-21. ^ "AMC wins Albania's second 3G licence". TeleGeography. 2011-09-06. Retrieved 2014-08-21. ^ "The Eagle has landed; incumbent swoops into 3G sector". TeleGeography. 2013-03-01. Retrieved 2014-08-13. ^ "Mobilkom set to launch 3G services in Austria". TeleGeography. 2003-04-16. Retrieved 2014-08-21. ^ "3 Austria offers mobile video services". Telecompaper. 2003-05-06. Retrieved 2014-08-21. ^ "Austria Gets Europe's First HSPA+ Mobile Data Network". cellular-news. 2009-03-22. Retrieved 2014-08-13. ^ "A1 boosts UMTS network with HSPA+ Dual Cell technology". Telecompaper. 2010-12-15. Retrieved 2014-08-13. ^ "Hutchison Planning LTE Launch Later This Year for Austrian Network". cellular-news. 2011-02-15. Retrieved 2014-08-13. ^ "life:) launches 3G network, claims a first for Belarus". TeleGeography. 2009-11-03. Retrieved 2014-08-21. ^ "Технологический роадмап и шокирующий анонс от life:)" (in Russian). connected.by.com. 2010-02-27. Retrieved 2014-08-13. ^ "KPN Group Belgium rebrands as BASE Company, launches DC-HSDPA". TeleGeography. 2013-04-18. Retrieved 2014-08-13. ^ "MobilTel launches HSDPA". TeleGeography. 2006-03-07. Retrieved 2014-08-21. ^ "Globul launches 3G". TeleGeography. 2006-10-02. Retrieved 2014-08-21. ^ "Bulgarian Operator Launches HSPA+ Upgrade". cellular-news. 2009-09-10. Retrieved 2014-08-13. ^ "M-Tel expands DC-HSDPA network". TeleGeography. 2013-02-05. Retrieved 2014-08-13. ^ "Globul offers mobile broadband in 210 localities". Telecompaper. 2013-12-17. Retrieved 2014-08-13. ^ "GloBul and Germanos to merge ahead of Telenor rebranding". TeleGeography. 2010-07-08. Retrieved 2014-10-31. ^ "Vipnet introduces HSPA+ in Croatia". Telecompaper. 2009-11-30. Retrieved 2014-08-13. ^ "Tele2 Croatia upgrading to 21Mbps HSPA+ in December". TeleGeography. 2010-10-25. Retrieved 2014-08-13. ^ "Vipnet offers 4G speeds in city of Osijek". Telecompaper. 2010-12-02. Retrieved 2014-08-13. ^ "Results for the three months to 31 March 2012" (PDF). Hrvatski Telekom. p. 26. Archived from the original (pdf) on 2015-09-24. Retrieved 2014-08-13. ^ "Cyta to launch Vodafone Mobile Connect". TelegeoGraphy. 2006-03-31. Retrieved 2014-08-21. ^ "Eurotel launches 3G". TeleGeography. 2005-12-02. Retrieved 2014-08-21. ^ "T-Mobile CR launches 3G/HSPA commercially". TeleGeography. 2010-01-29. Retrieved 2014-08-21. ^ "Vodafone CR expands 3G network". TeleGeography. 2010-09-23. Retrieved 2018-04-24. ^ "T-Mobile Germany introduces Nokia UMTS phone for consumers". Telecompaper. 2004-05-04. Retrieved 2014-08-21. ^ a b "Vodafone Live! 3G offering hits Europe". TeleGeography. 2004-05-04. Retrieved 2014-08-21. ^ "O2 Germany to launch UMTS for consumers on 1 July". Telecompaper. 2004-06-24. Retrieved 2014-08-21. ^ "STET Hellas launches UMTS services". TeleGeography. 2004-01-22. Retrieved 2014-08-21. ^ "Cosmoté launches 3G". TeleGeography. 2004-06-03. Retrieved 2014-08-21. ^ "Wave launches 3G". TeleGeography. 2004-07-13. Retrieved 2014-08-21. ^ "Vodafone soft launches Irish 3G services". TeleGeography. 2003-05-02. Retrieved 2014-08-21. ^ "O2 Ireland goes 3G". TeleGeography. 2003-12-15. Retrieved 2014-08-21. ^ "Hutch 3G launch takes Ireland by surprise". TeleGeography. 2005-07-27. Retrieved 2014-08-21. ^ "T-Mobile Austria launches UMTS services" (in German). Telecompaper. 2003-12-11. Retrieved 2014-08-21. ^ "T-Mobile and NSN complete HSPA upgrade". TeleGeography. 2010-04-23. Retrieved 2014-08-13. ^ "T-Mobile Austria upgrades to HSPA+ with NSN". Telecompaper. 2011-01-19. Retrieved 2014-08-13. ^ "Interview mit T-Mobile CTO Rüdiger Köster zum Netzausbau und zur Zukunft des Mobilfunks" (in German). T-Mobile Austria. 2016-12-19. Retrieved 2018-01-09. ^ "MTS Belarus launches commercial 3G network services". Telecompaper. 2010-05-30. Retrieved 2014-08-21. ^ "MTS Belarus reports 800,000 3G mobile internet subscribers". TeleGeography. 2012-10-23. Retrieved 2014-08-13. ^ "MTS Belarus rolls out UMTS-900 to 'almost all' of Minsk region". TeleGeography. 2016-03-16. Retrieved 2016-04-21. ^ "Velcom launches commercial UMTS/HSPA/HSPA+ network". TeleGeography. 2010-03-18. Retrieved 2014-08-21. ^ "Velcom sells DC HSDPA modem". Telecompaper. 2011-07-07. Retrieved 2014-08-13. ^ "Velcom launches UMTS-900 technology in Belarus". TeleGeography. 2016-02-02. Retrieved 2016-02-02. ^ "Proximus launches 3G for consumers". TeleGeography. 2005-09-15. Retrieved 2014-08-21. ^ "Proximus upgrades 3G speeds". Telecompaper. 2008-08-13. ^ "Vivatel to launch 3G network next week". 2007-04-17. Retrieved 2014-08-21. ^ "Vivacom надгради 3G станциите си до 21 Mbps HSPA+" (in Bulgarian). Computerworld. 2012-10-02. Retrieved 2014-08-13. ^ "Vivacom increases 3G speeds to 42 Mbps in big cities". Telecompaper. 2013-02-04. Retrieved 2014-08-13. ^ "TDC upgrades 4G, 3G mobile networks". Telecompaper. 2014-07-17. Retrieved 2014-07-17. ^ "Sonofon launches 3G service". Telecompaper. 2006-09-27. Retrieved 2014-08-21. ^ "NSN powers TeliaSonera 3G broadband radio network in Denmark". Telecompaper. 2007-12-20. Retrieved 2014-08-21. ^ "EMT launches 3G network". TeleGeography. 2005-10-05. Retrieved 2014-08-21. ^ "DNA announces 3G launch". TeleGeography. 2005-12-20. Retrieved 2014-08-21. ^ "DNA to offer 3G services on 900MHz; 2100MHz rollout to continue". TeleGeography. 2008-11-06. Retrieved 2014-08-21. ^ "Elisa launches 3G". TeleGeography. 2004-11-25. Retrieved 2014-08-21. ^ "Elisa launches world's first commercial UMTS-900 network". TeleGeography. 2007-11-08. Retrieved 2014-08-21. ^ "Bouygues' HSDPA goes live, paper says". TeleGeography. 2007-05-01. Retrieved 2014-08-21. ^ "Iliad's odyssey underway as Free Mobile finally launches". TeleGeography. 2012-01-10. Retrieved 2014-08-21. ^ a b "Orange launches long-awaited 3G service". TeleGeography. 2004-12-07. Retrieved 2014-08-21. ^ "SFR expands 3G network". TeleGeography. 2004-11-11. Retrieved 2014-08-21. ^ "Pannon GSM launches 3G". TeleGeography. 2005-10-12. Retrieved 2014-08-21. ^ "T-Mobile launches pilot 3G service in Budapest". TeleGeography. 2005-06-06. Retrieved 2014-08-21. ^ "Vodafone Hungary launches full-blown 3G service". TeleGeography. 2006-06-13. Retrieved 2014-08-21. ^ "Siminn launches 3G". TeleGeography. 2007-09-10. Retrieved 2014-08-21. ^ "Ericsson expands Siminn's W-CDMA network in the 900MHz band". TeleGeography. 2008-08-14. Retrieved 2014-08-21. ^ "3G gets off to a good start for TIM". TeleGeography. 2004-05-25. Retrieved 2014-08-21. ^ "Vodafone Italy announces UMTS launch for consumers". TeleGeography. 2004-05-27. Retrieved 2014-08-21. ^ "Jersey Telecom plans June 3G launch". TeleGeography. 2006-05-08. Retrieved 2014-08-21. ^ "IPKO delivers 3G as promised". TeleGeography. 2013-12-03. Retrieved 2014-08-21. ^ "Vala launches 3G; Vala/IPKO unveil 4G plans". TeleGeography. 2014-11-26. Retrieved 2014-11-26. ^ a b "BITE to launch 3G in Lithuania in April, Latvia in June". Telecompaper. 2006-02-24. Retrieved 2014-08-21. ^ "P&T Luxembourg launches UMTS services". Telecompaper. 2003-07-01. Retrieved 2014-08-21. ^ "P&T Luxembourg, LuxGSM to rebrand as Post Telecom". TeleGeography. 2013-06-20. Retrieved 2013-12-27. ^ "Tango launches 3G network". Telecompaper. 2003-05-01. Retrieved 2014-08-21. ^ "Cosmofon lifts off with 3G". TeleGeography. 2008-09-17. Retrieved 2014-08-21. ^ "VIP launches HSPA+ network". TeleGeography. 2012-08-31. Retrieved 2014-08-21. ^ "Go mobile launches 3.5G, 3G mobile technology in Malta". 2007-05-01. Retrieved 2014-08-21. ^ "Vodafone launches 3G". TeleGeography. 2006-08-21. Retrieved 2014-08-21. ^ "Moldcell launches 3G services". TeleGeography. 2008-09-25. Retrieved 2014-08-21. ^ "Orange Moldova launches 3G+ network". TeleGeography. 2008-11-10. Retrieved 2014-08-21. ^ "Moldtelecom unveils 3G network". TeleGeography. 2010-05-25. Retrieved 2014-08-21. ^ a b "ProMonte, T-Mobile activate 3G networks in Montenegro". Telecompaper. 2007-06-25. Retrieved 2014-08-21. ^ "Montenegro's M:Tel activates signal, plans sales from 9 July". Telecompaper. 2007-07-05. Retrieved 2014-08-21. ^ "KPN launches 3G to consumers". TeleGeography. 2004-10-12. Retrieved 2014-08-21. ^ "KPN to complete UMTS 900 roll-out by year-end". Telecompaper. 2014-03-17. Retrieved 2014-03-17. ^ "KPN finishes UMTS 900MHz network rollout". TeleGeography. 2014-10-17. Retrieved 2014-10-17. ^ "KPN shutting 3G by January 2022". TeleGeography. 2018-07-27. Retrieved 2018-07-27. ^ "T-Mobile Netherlands launches HSDPA data card". Telecompaper. 2006-01-27. Retrieved 2014-08-21. ^ "Vodafone achieves 3G first". TeleGeography. 2004-06-16. Retrieved 2014-08-21. ^ "VodafoneZiggo to ditch Dutch 3G network in 2020". TeleGeography. 2017-12-15. Retrieved 2018-02-24. ^ "KKTCell introduces DC-HSPA+ in Turkish Republic of Northern Cyprus". TeleGeography. 2013-01-25. Retrieved 2014-08-21. ^ "Telenor launches 3G". TeleGeography. 2004-12-01. Retrieved 2014-08-21. ^ "Polish Operator Launches HSPA+ Network in 900Mhz Band". cellular-news. 2009-11-03. Retrieved 2014-08-13. ^ "Polkomtel beats rivals to 3G launch". TeleGeography. 2004-09-03. Retrieved 2014-08-21. ^ "PTC launches 3G in Warsaw". TeleGeography. 2005-04-12. Retrieved 2014-08-21. ^ "TMN launches 3G". TeleGeography. 2004-04-20. Retrieved 2014-08-21. ^ "Optimus completes Portugal's 3G line-up". TeleGeography. 2004-06-04. Retrieved 2014-08-21. ^ "RCS&RDS launches DigiMobil". TeleGeography. 2007-12-17. Retrieved 2014-08-21. ^ "RCS&RDS to increase coverage of Digi Mobil 3G network". Telecompaper. 2014-08-21. Retrieved 2014-08-21. ^ "Orange Romania's 3G service claims 25,000 users in first three days". TeleGeography. 2006-06-13. Retrieved 2014-08-21. ^ "RomTelecom, Cosmote rebrand as Telekom Romania next month". TeleGeography. 2014-08-15. Retrieved 2014-09-14. ^ "MobiFon to introduce Romanian 3G". TeleGeography. 2005-04-18. Retrieved 2014-08-21. ^ "Vodafone Romania a lansat miercuri serviciile 3G in frecventa 900 MHz". Business24. 2010-04-28. Retrieved 2014-08-21. ^ "Beeline significantly increases Moscow capacity with UMTS-900". TeleGeography. 2017-08-19. Retrieved 2017-08-19. ^ "Vimpelcom switches on 3G". TeleGeography. 2008-09-03. Retrieved 2014-08-21. ^ "MegaFon announces limited 3G switch-on". TeleGeography. 2007-10-03. Retrieved 2014-08-21. ^ "3G for MTS". TeleGeography. 2008-05-29. Retrieved 2014-08-21. ^ "MTS Srbija launches 3G offering". TeleGeography. 2007-01-12. Retrieved 2014-08-21. ^ "Telenor sets March as 3G launch date". TeleGeography. 2007-01-22. Retrieved 2014-08-21. ^ "Telefonica Slovakia to launch commercial 3G network on 18 July". TeleGeography. 2011-05-26. Retrieved 2014-08-21. ^ "Orange Slovensko launches commercial 3G and HSDPA services". TeleGeography. 2006-08-25. Retrieved 2014-08-21. ^ "T-Mobile Slovensko announces UMTS launch; Orange not far behind". TeleGeography. 2006-01-26. Retrieved 2014-08-21. ^ "Simobil launches 3G UMTS network in Slovenia". Telecompaper. 2007-09-11. Retrieved 2014-08-21. ^ "UMTS-900 proves great white space filler for Si.Mobil 3G". TeleGeography. 2011-07-08. Retrieved 2014-08-21. ^ "T-2 launches mobile services". Telecompaper. 2008-06-17. Retrieved 2014-08-21. ^ "Mobitel to launch pilot 3G network". TeleGeography. 2003-12-11. Retrieved 2014-08-21. ^ "Telekom Slovenije closes down Mobitel website". Telecompaper. 2014-07-02. Retrieved 2014-07-02. ^ "Telefonica Moviles Espana launches consumer UMTS services". Telecompaper. 2004-05-24. Retrieved 2014-08-21. ^ "Amena unveils UMTS mobile phone service". Telecompaper. 2004-10-21. Retrieved 2014-08-21. ^ "Vodafone Spain launches 3G services for consumers". Telecompaper. 2004-05-27. Retrieved 2014-08-21. ^ "Yoigo is GO!". TeleGeography. 2006-12-01. Retrieved 2014-08-21. ^ "3 Sweden officially starts to take pre-bookings". Telecompaper. 2003-05-05. Retrieved 2014-08-21. ^ "3 Sweden utilises 900MHz in 3G expansion". TeleGeography. 2011-05-26. Retrieved 2017-09-24. ^ "Comviq launches 3G services". Telecompaper. 2004-06-02. Retrieved 2014-08-21. ^ "TeliaSonera Sweden opens 3G network". Telecompaper. 2004-03-10. Retrieved 2014-08-21. ^ "Orange Switzerland will launch UMTS services in September". Telecompaper. 2005-08-19. Retrieved 2014-08-21. ^ "Sunrise to launch mobile broadband based on GPRS/EDGE/UMTS". Telecompaper. 2005-11-21. Retrieved 2014-08-21. ^ (German) "Sunrise lanciert LTE Hochgeschwindigkeitsnetz - Erweiterung der UMTS Abdeckung". Sunrise. 2012-10-18. Retrieved 2013-12-29. ^ "Swiss 3G and Mobile TV services". 3g.co.uk. 2004-11-24. Retrieved 2014-08-21. ^ "3G arrives in Ukraine". TeleGeography. 2007-11-06. Retrieved 2014-08-21. ^ "3 UK has three 3G offers; starts selling Feb. 22". Telecompaper. 2003-02-07. Retrieved 2014-08-21. ^ "3 UK launches Huawei E367 premium dongle". Telecompaper. 2011-03-31. Retrieved 2014-08-13. ^ "Hutchison 3G UK to Upgrade HSPA+ Network and Prepare for LTE Trials". cellular-news. 2012-02-29. Retrieved 2014-08-13. ^ "T-Mobile launches 3G data card". TeleGeography. 2004-07-20. Retrieved 2014-08-21. ^ "Orange and T-Mobile 3G networks merged, Everything Everywhere completes big switch-on". Recombu. 2012-05-23. Retrieved 2014-08-13. ^ "Everything Everywhere targets 4G in 2012; DC-HSDPA in Q4". TeleGeography. 2012-02-23. Retrieved 2014-08-13. ^ "O2 UK starts 3G in 900MHz band". Telecompaper. 2011-03-18. Retrieved 2014-08-24. ^ "O2 UK rolling out DC-HSDPA?". TeleGeography. 2012-05-16. Retrieved 2014-08-13. ^ "Vodafone UK launches UMTS services for businesses". Telecompaper. 2004-04-02. Retrieved 2014-08-21.